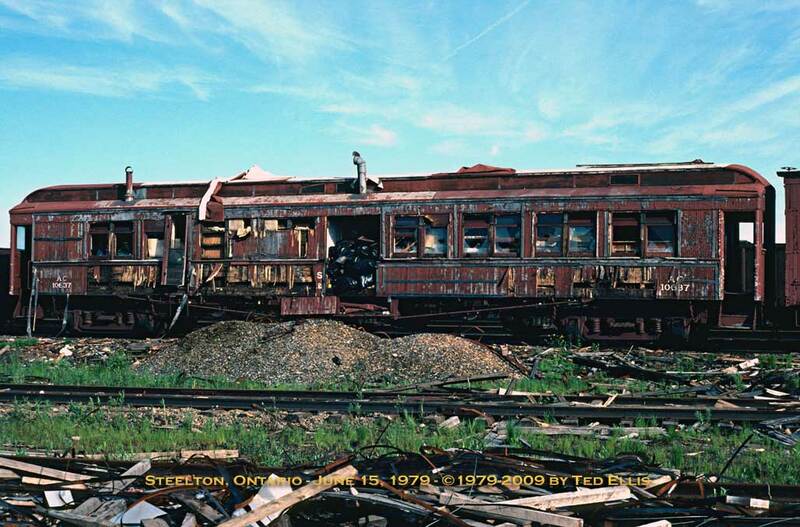 This roster is derived strictly from photographs, most of which are from the late 1970's. 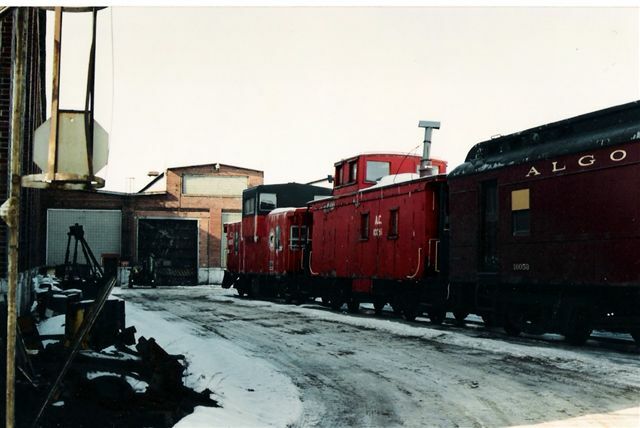 Little is actually known about purchase/retirement dates and there is some, but very little, here about earlier equipment. 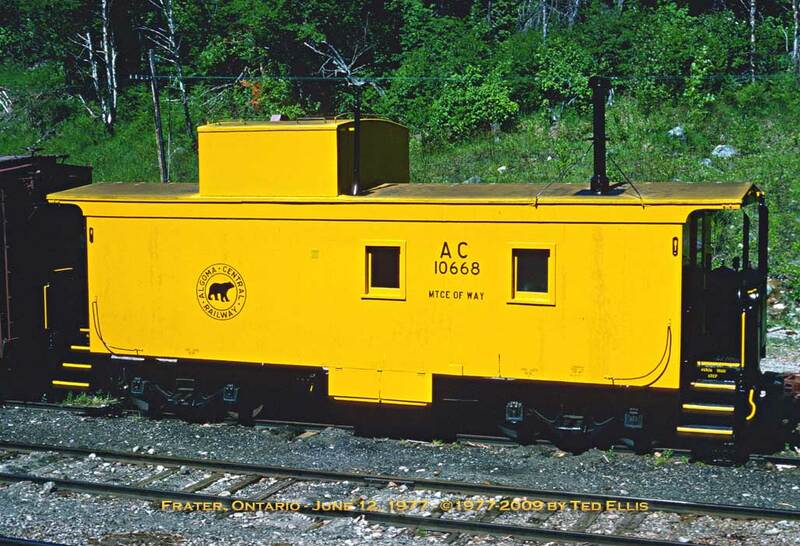 However, this listing shoud be an excellent reference for 1970's-1980's modellers. 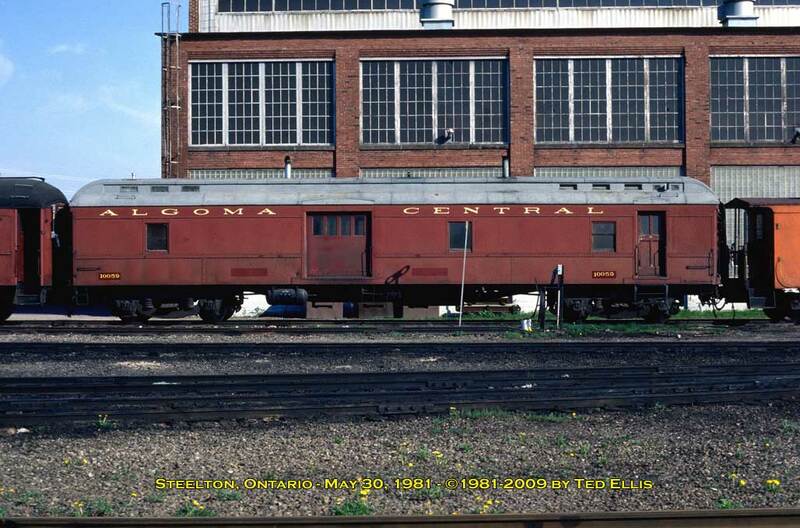 If anyone has photos of service equipment, please scan them and send them to me as email attachments, and I will place them in the photo gallery. 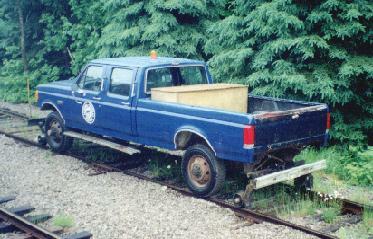 If this is not possible, send me the car's number as well as a detailed description. 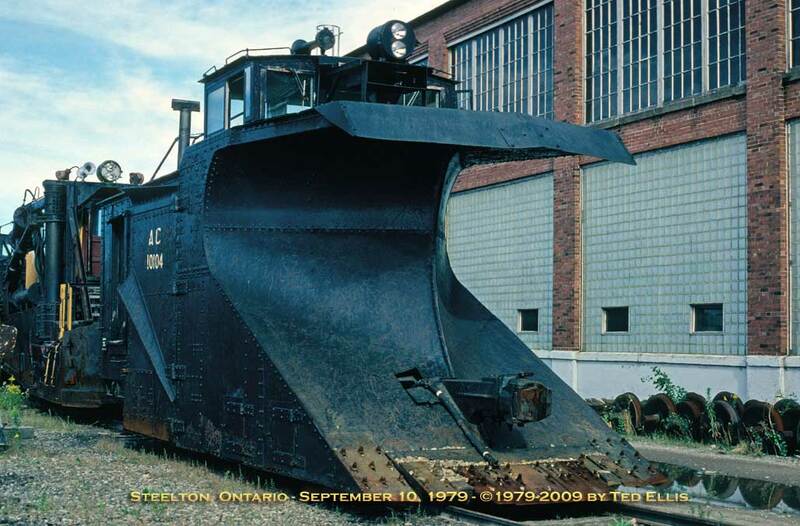 In either case, please include any information, including location, but most importantly, date. 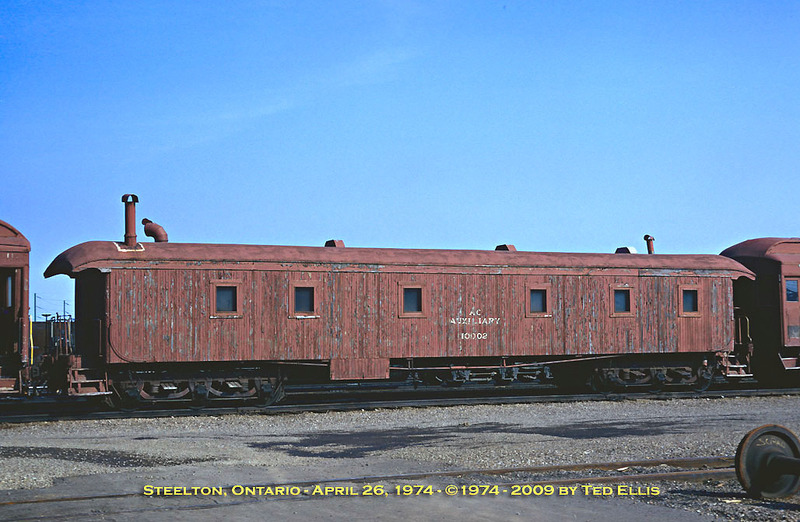 Any information would be greatly appreciated. 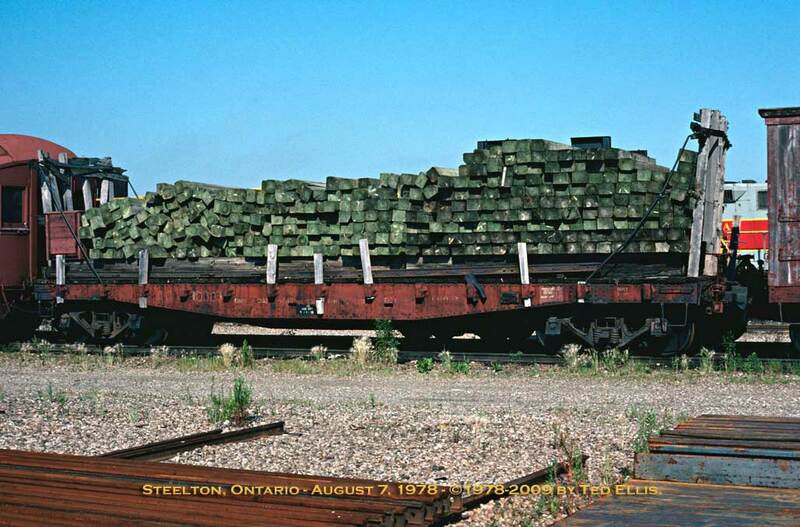 10042 Flatcar This flatcar is one the ACR's old 40' cars and has short wood ends that appear to be 2-3' in height. 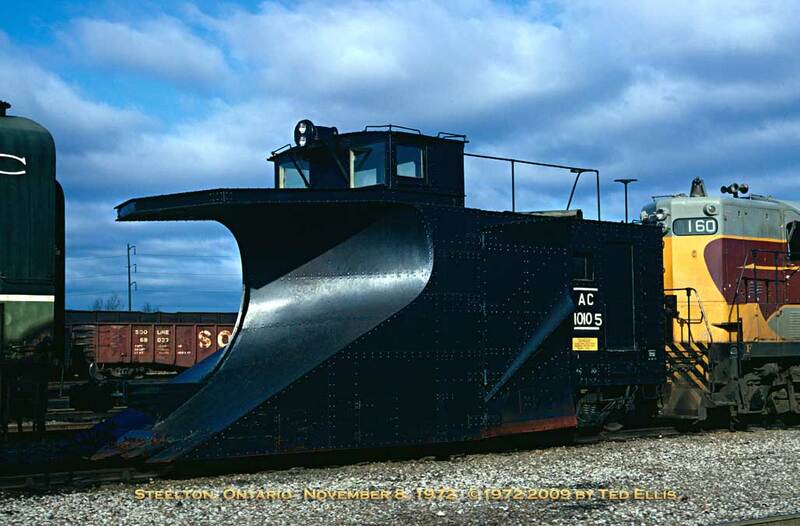 10104 Snowplow Snowplow 10104 was used mainly on the north end subdivision and is normally stationed at Hawk Junction. 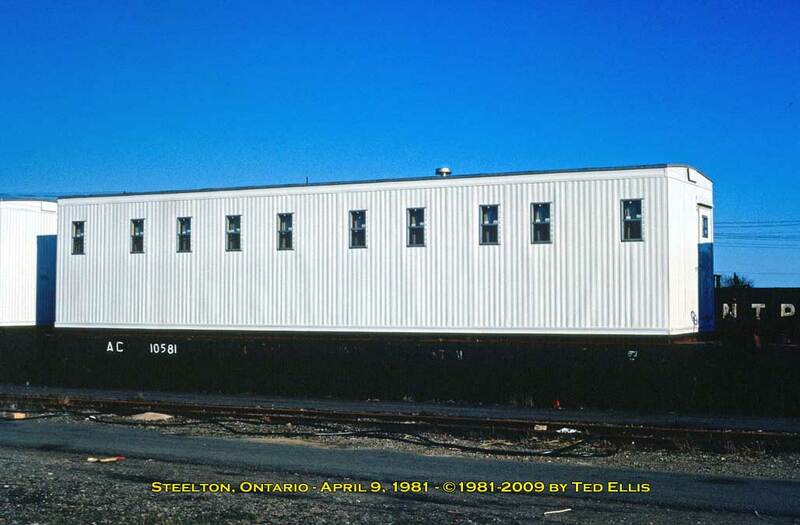 Built 1911. 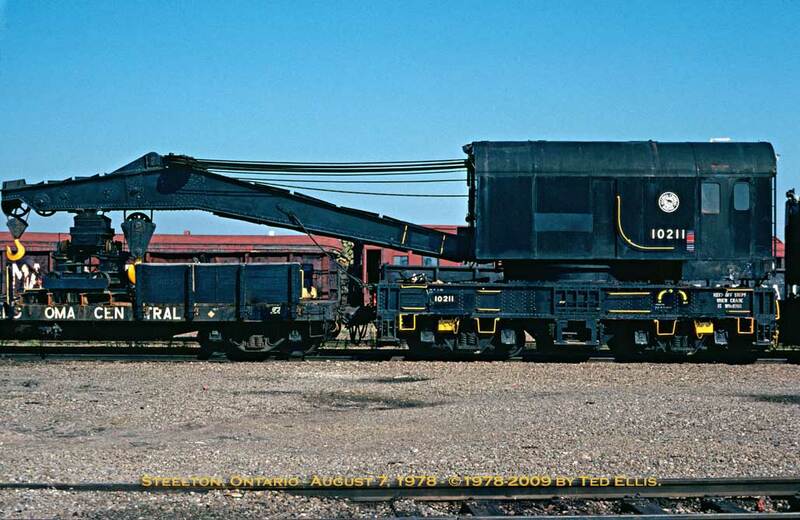 10105 Snowplow 10105 was typically the south end snowplow. 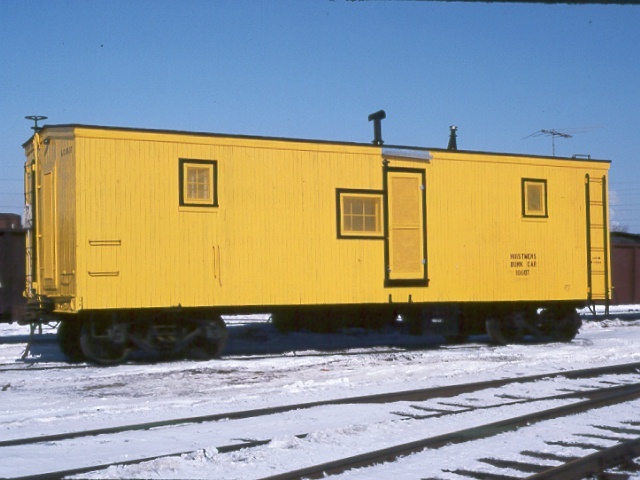 Built 1940. 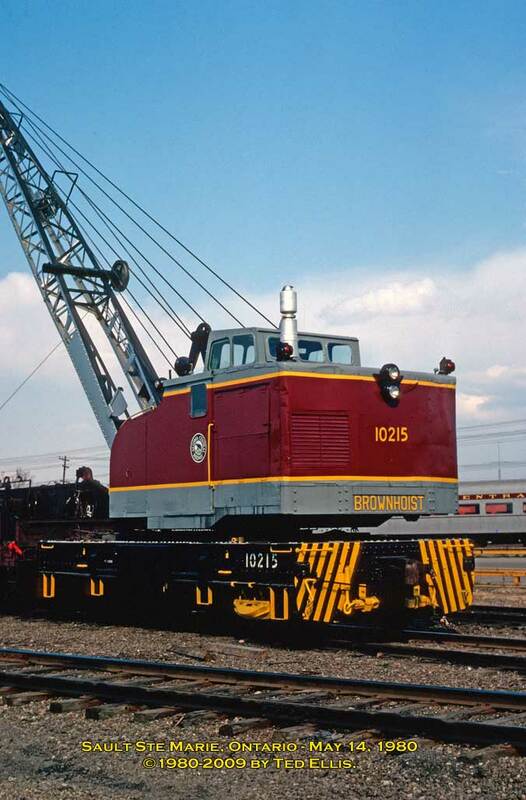 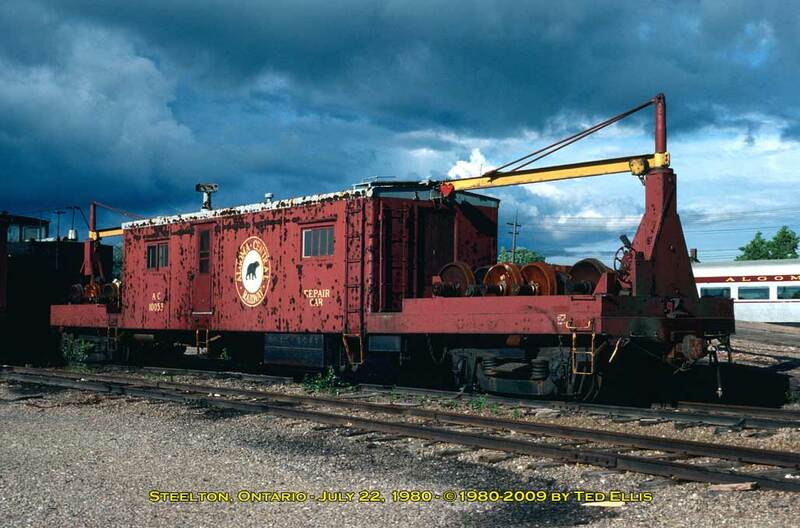 Diesel Crane - The ACR owned an example of a rare Canadian crane. 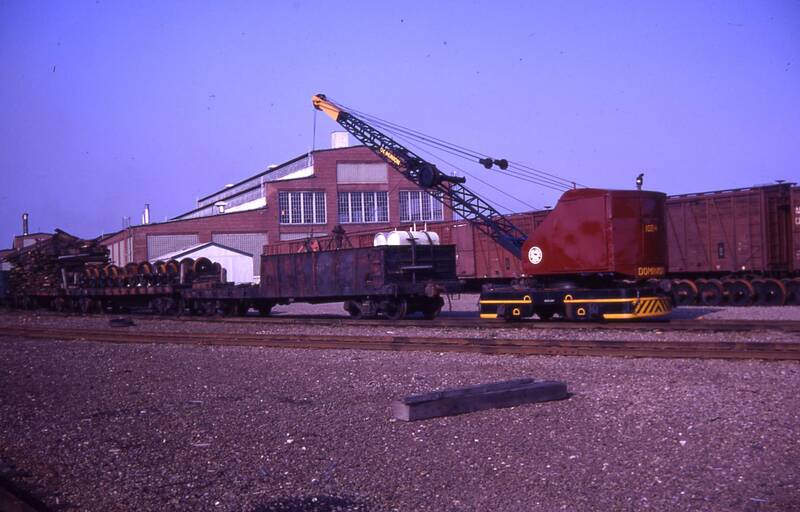 Dominion Engineering Works of Lachine, Quebec was Canada's crane and shovel manufacturer. 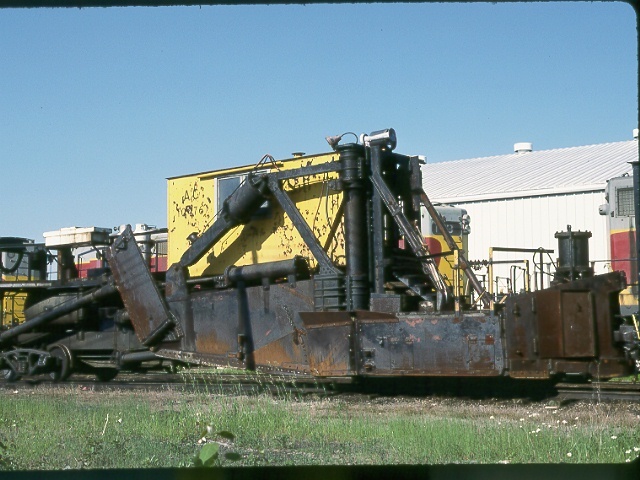 The company, originally known as Dominion Hoist and Shovel, later the Power Crane and Shovel Division of Dominion Engineering, produced a full line of crawler, truck mounted and rail mounted cranes and shovels. 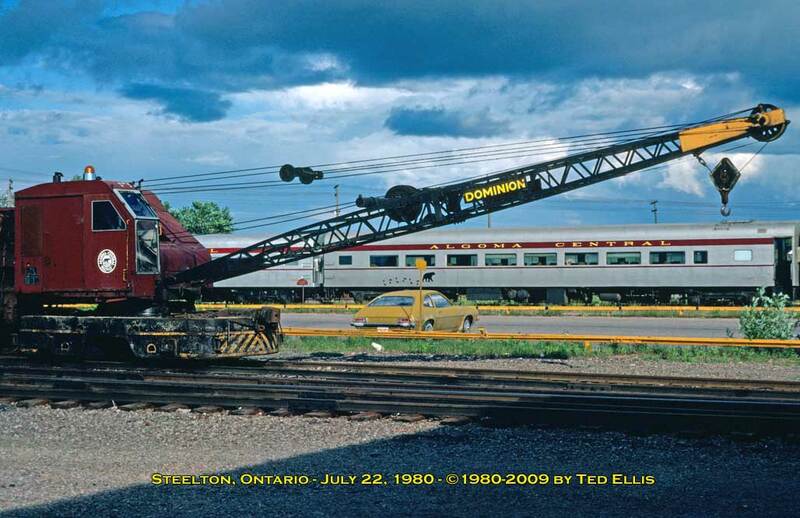 Dominion shovel-cranes were popular with Canada's railways. 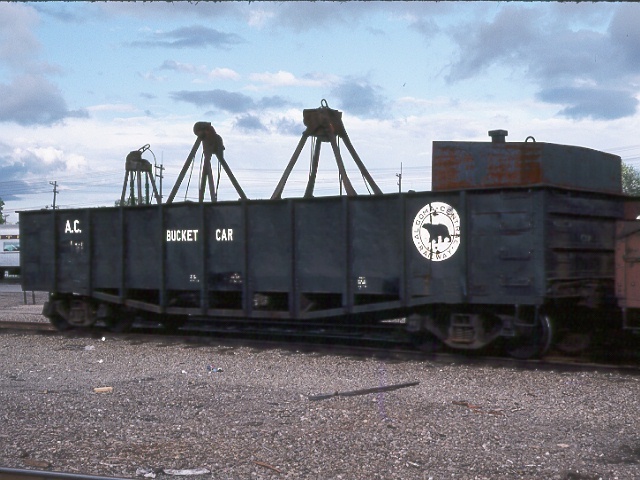 Beginning in 1945 Dominion offered a small rail mounted machine intended to compete with the Burro crane. 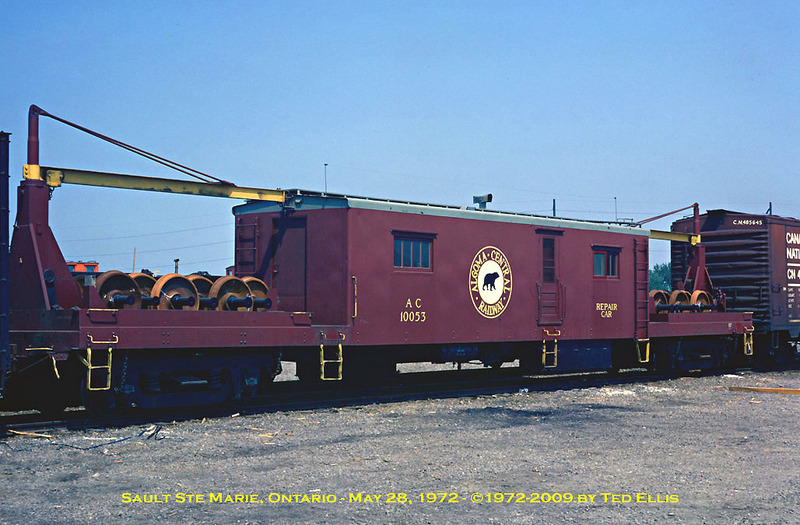 It was called the "Dominion Bantam Rail Crane". 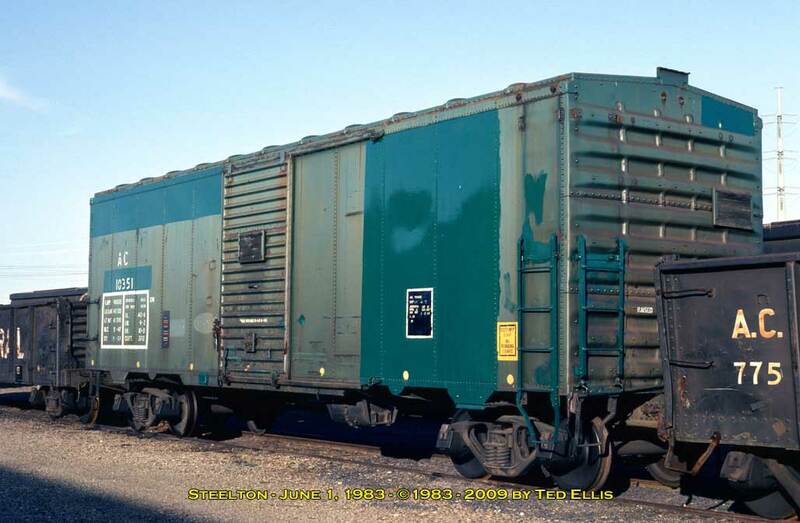 Ten were sold and one, serial BC-108B went to the ACR in 1954. 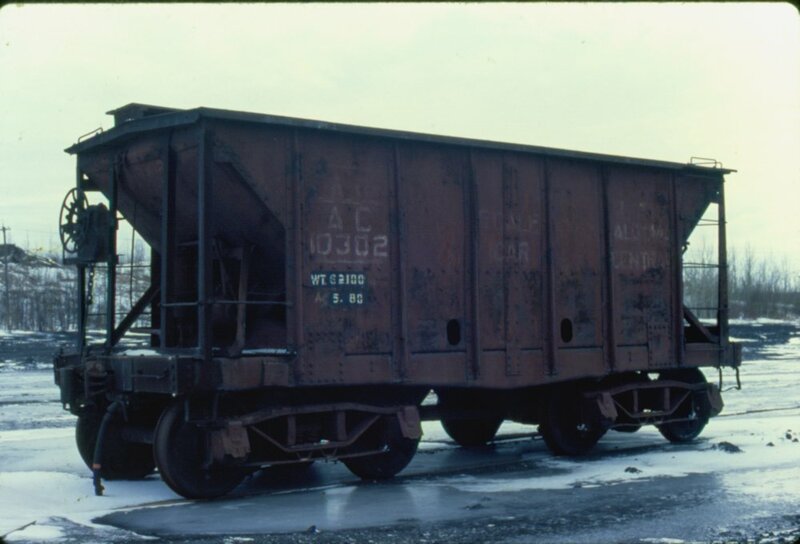 It had a long life, lasting at least until 1980. 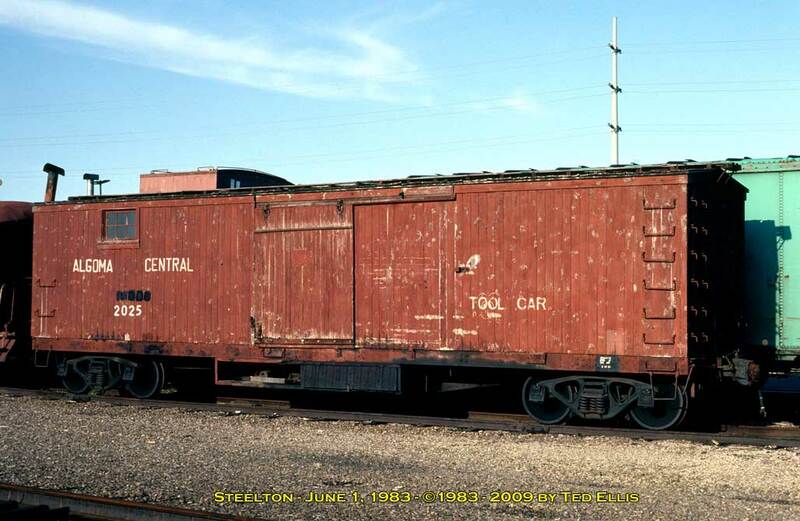 10302 Scale test car The ACR's old scale test car was an old Pressed Steel Car Co. ore car. 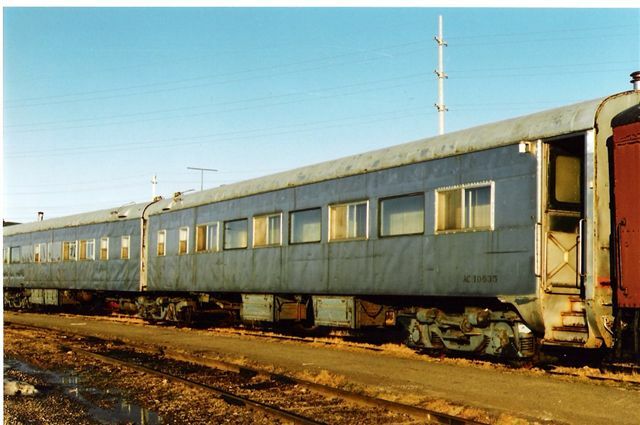 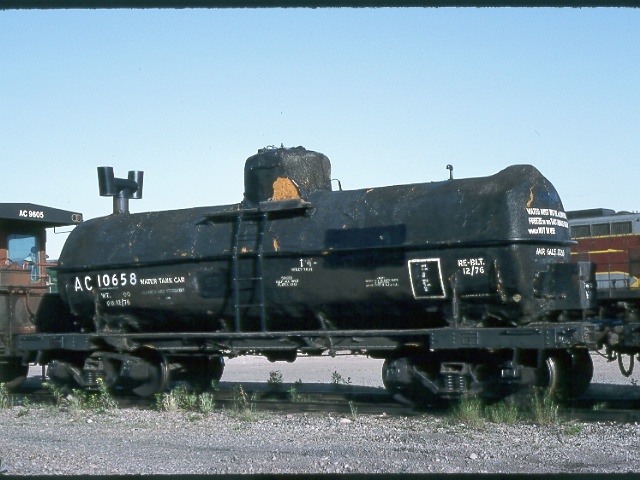 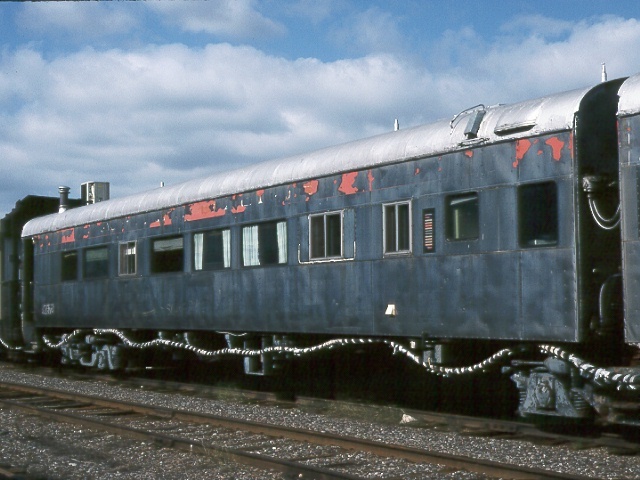 Now long retired, this car can be seen at the Canadian Railway Museum. 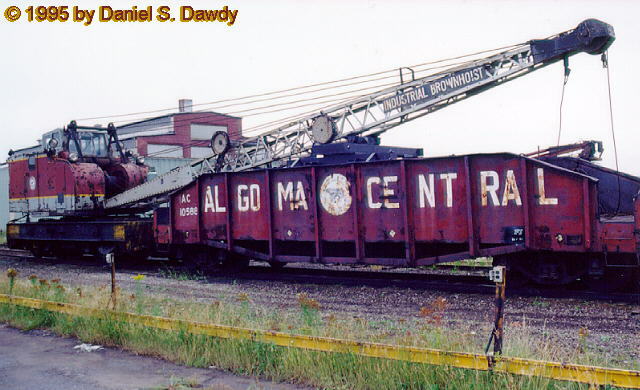 10427 Ballast Unloader This car is called a "lidgerwood" and it uses a large winch powered by an adjacent steam locomotive to pull a wedge through a line of drop-end gondolas. 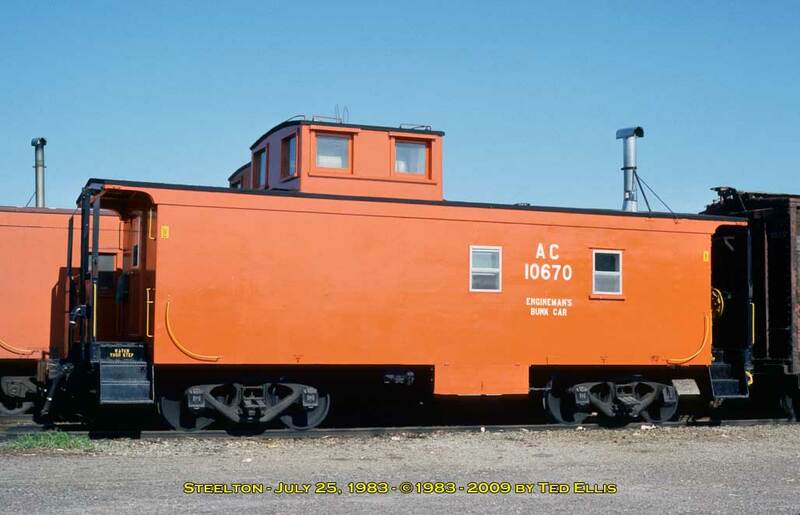 10603 Cook Car Converted from an old 36' wood boxcar. 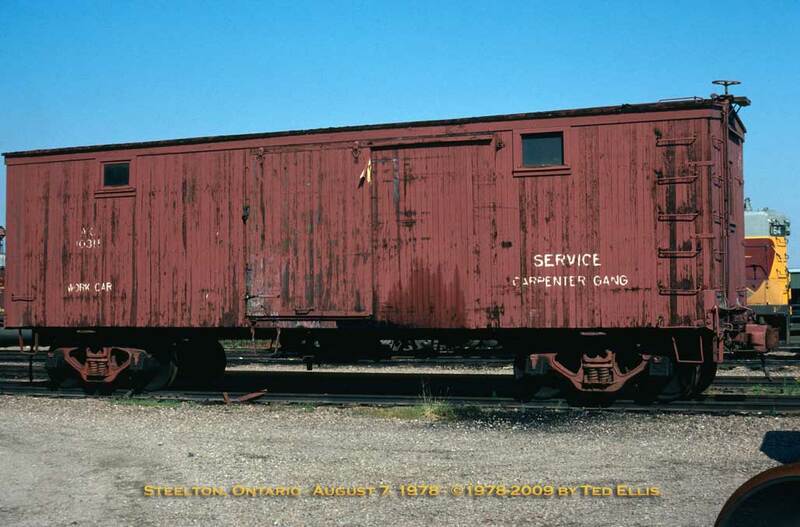 10604 Supervisor's Car Converted from an old 36' wood boxcar. 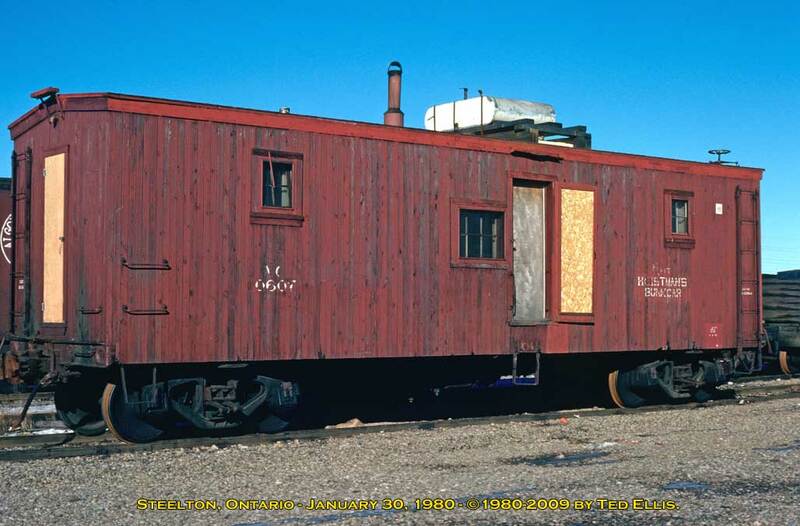 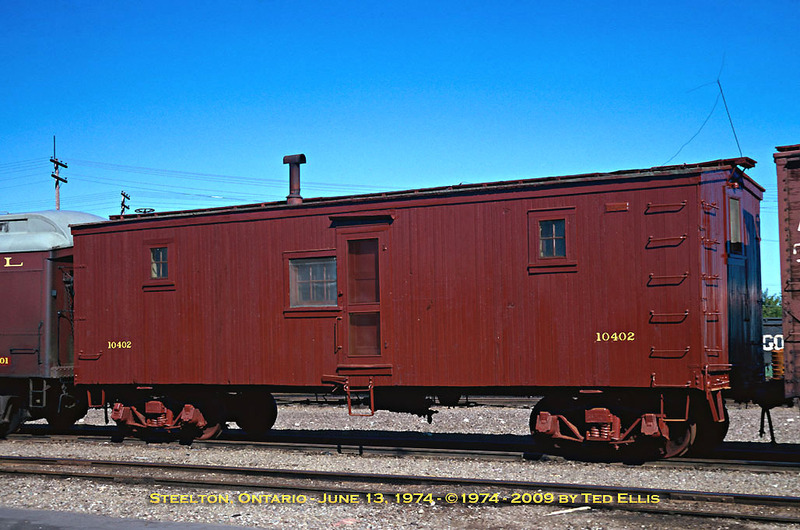 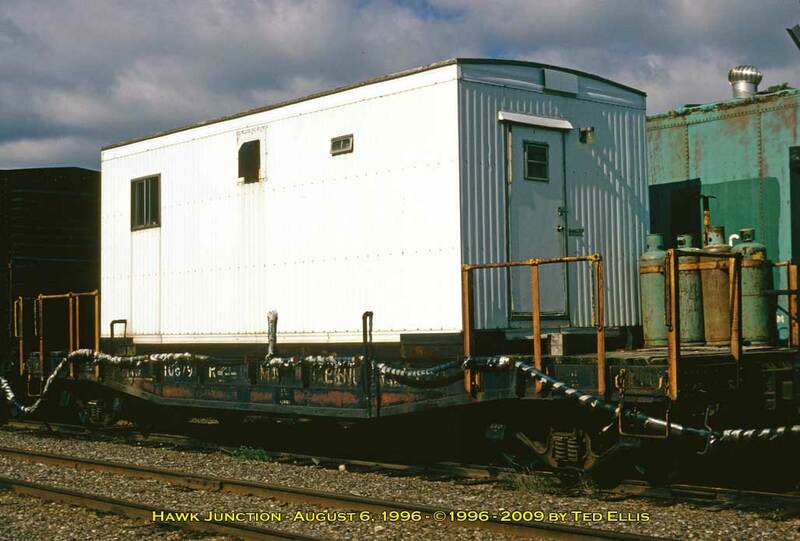 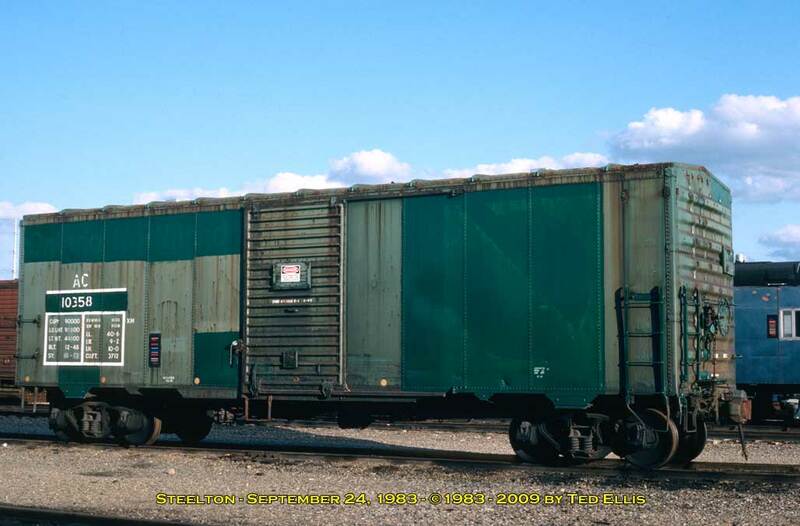 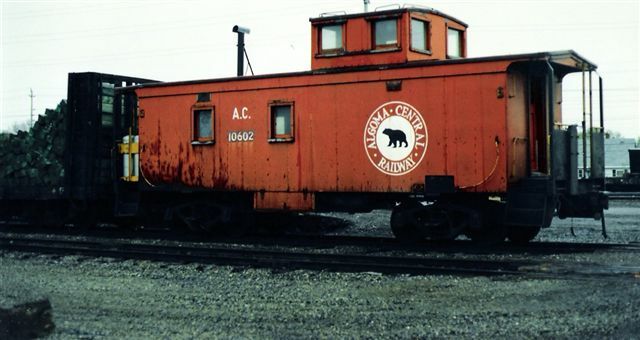 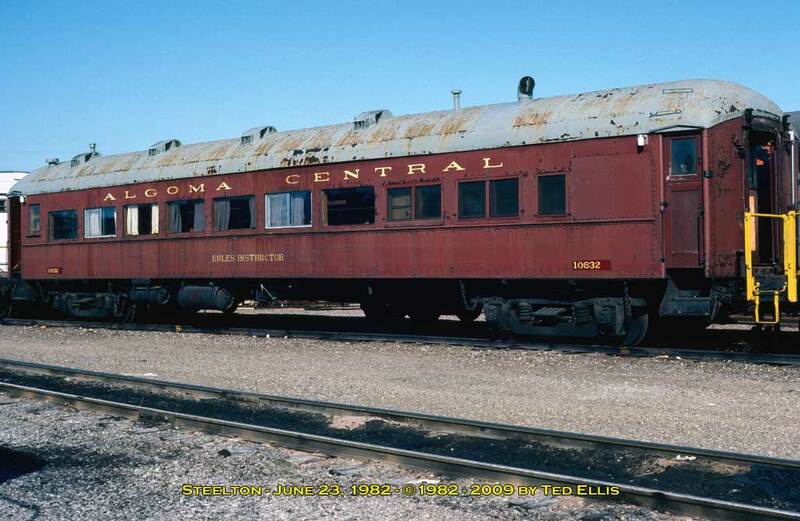 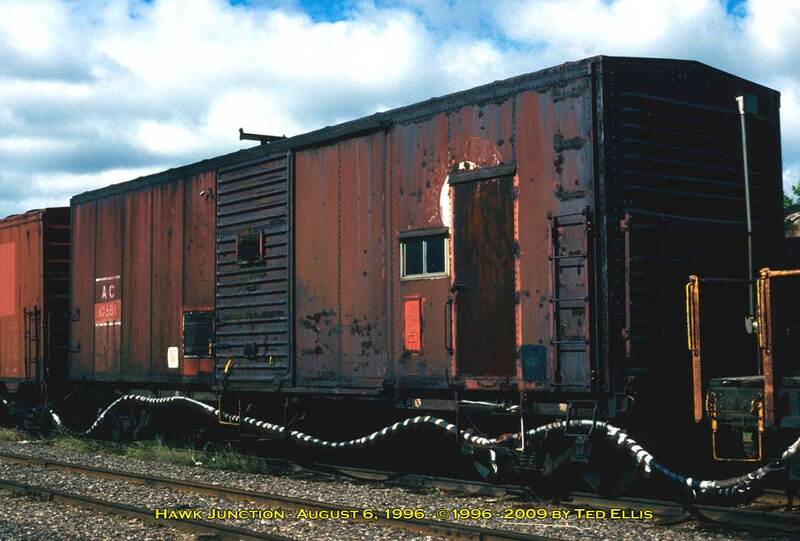 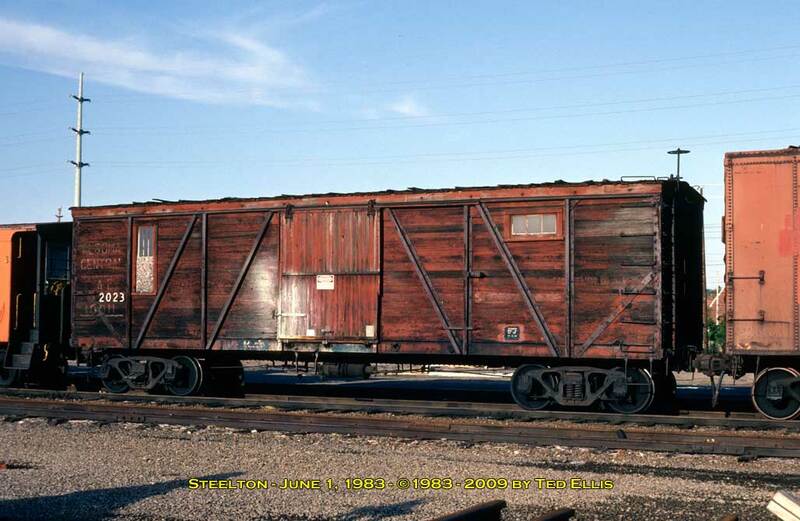 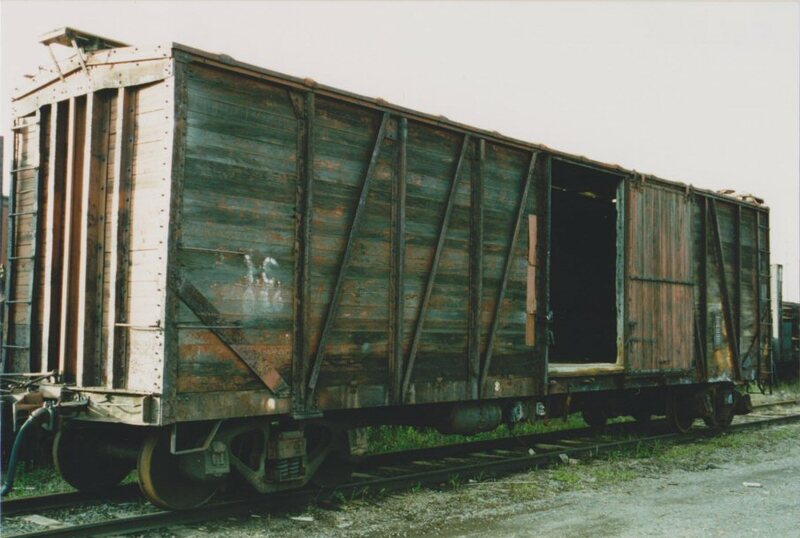 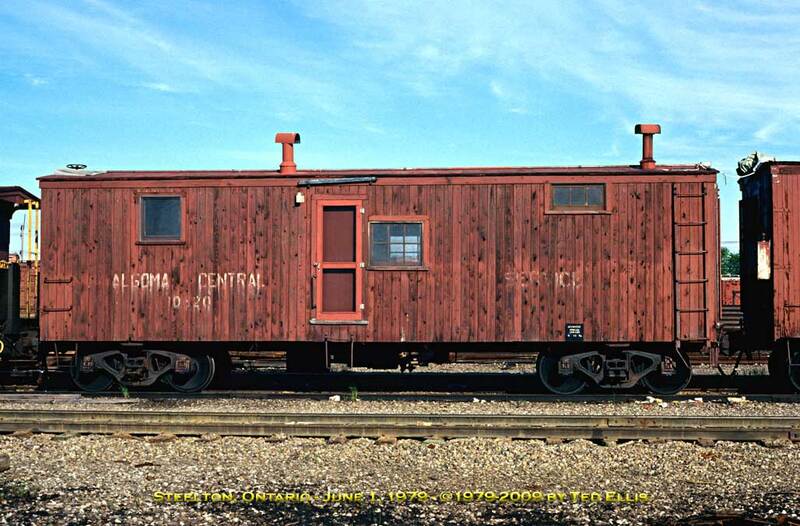 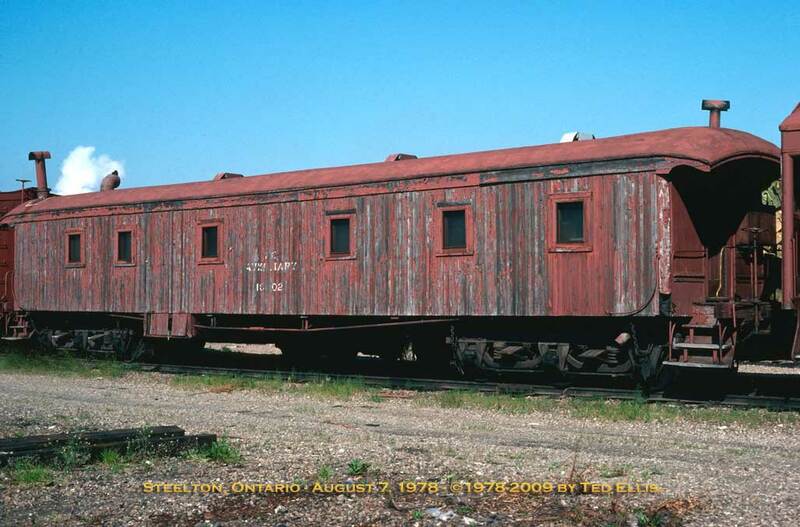 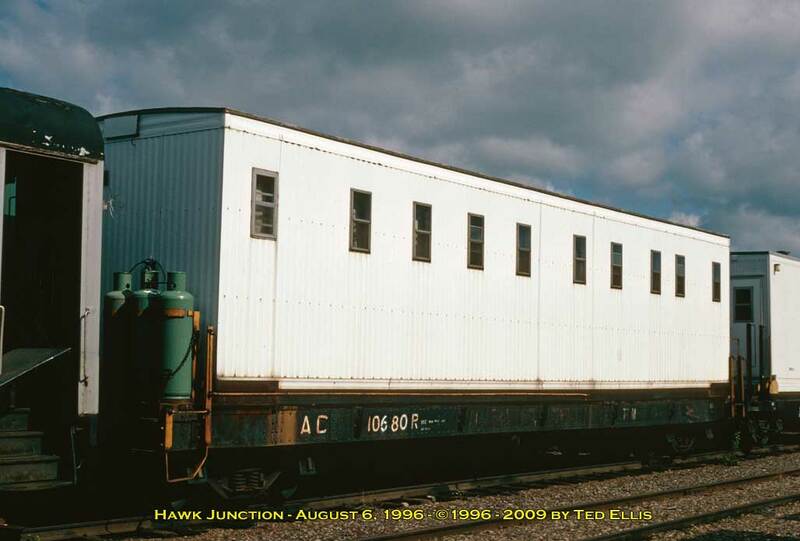 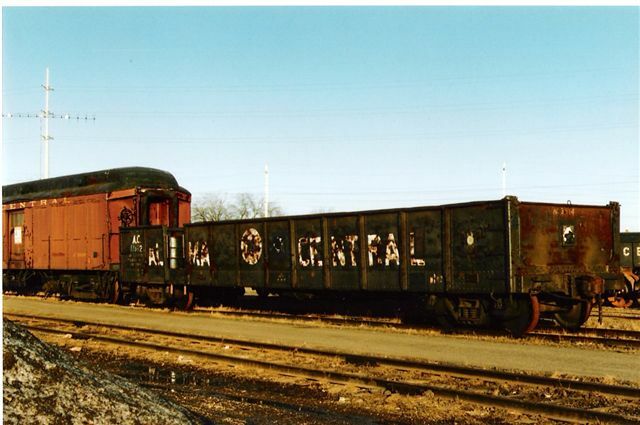 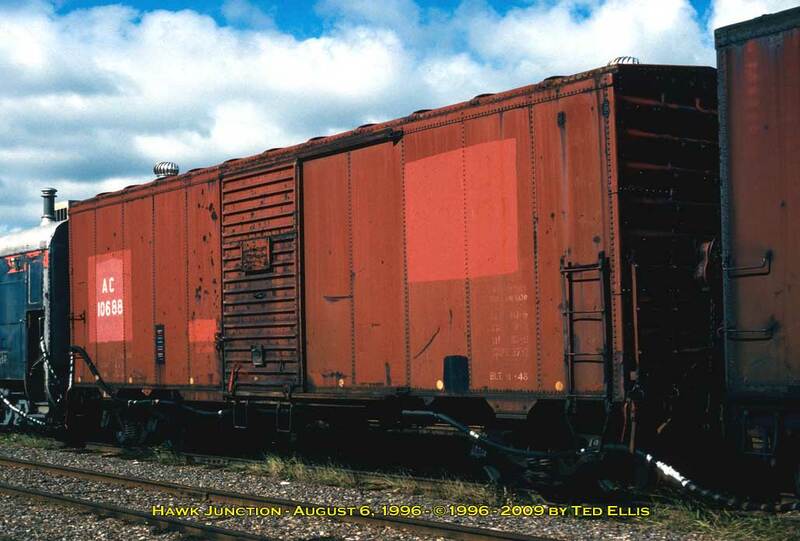 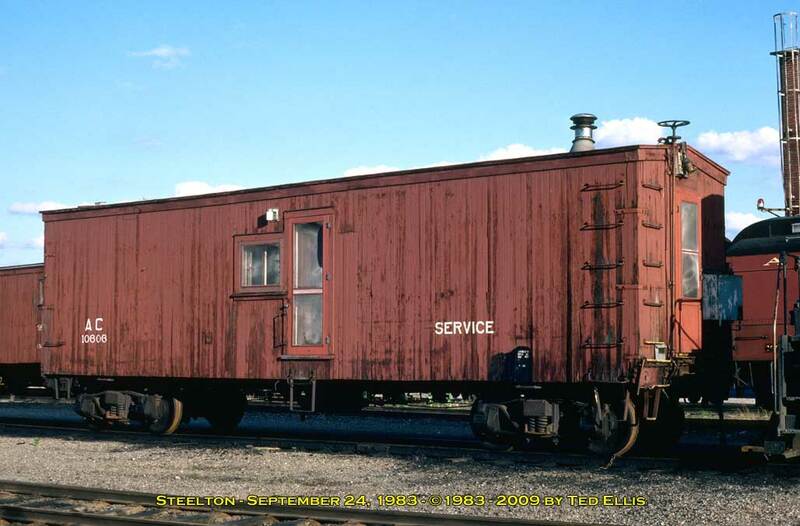 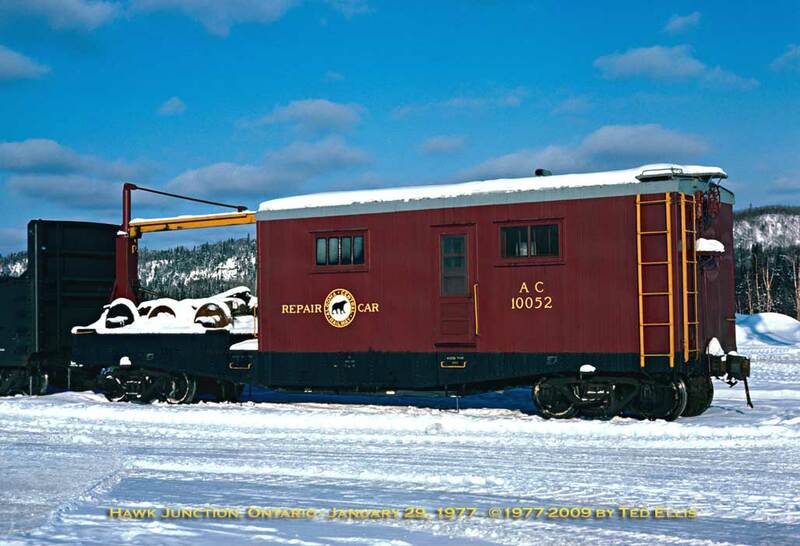 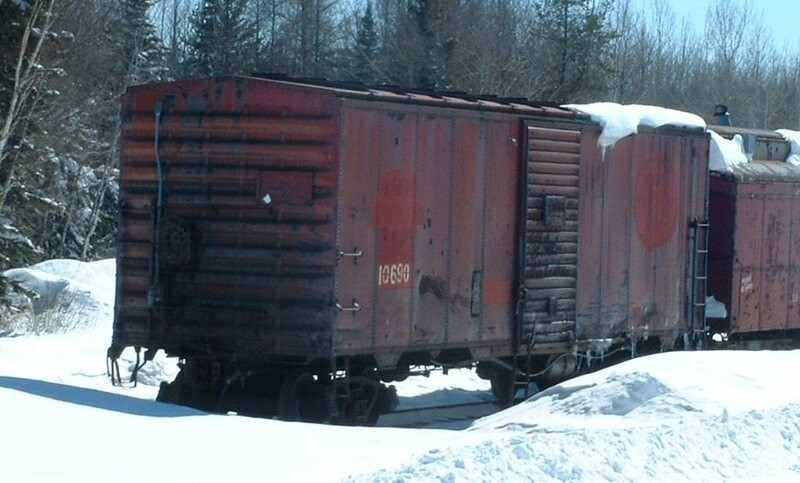 10605:1 Bunk Car Converted from an old 36' wood boxcar. 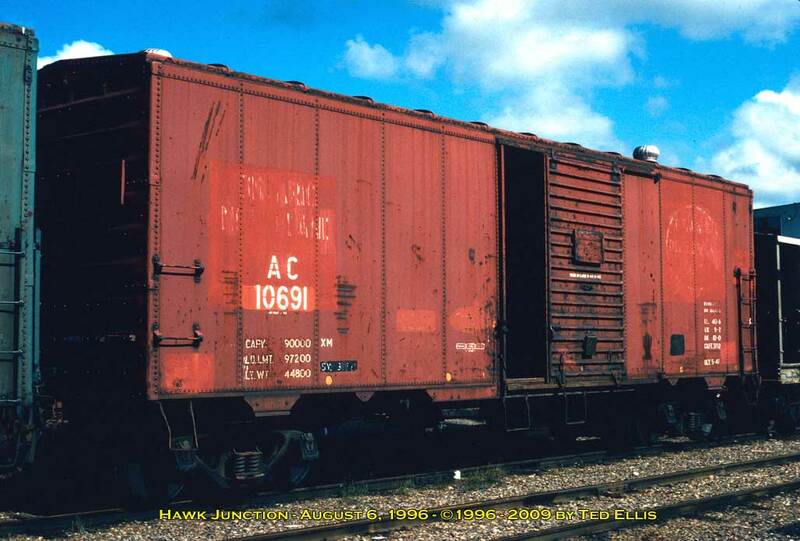 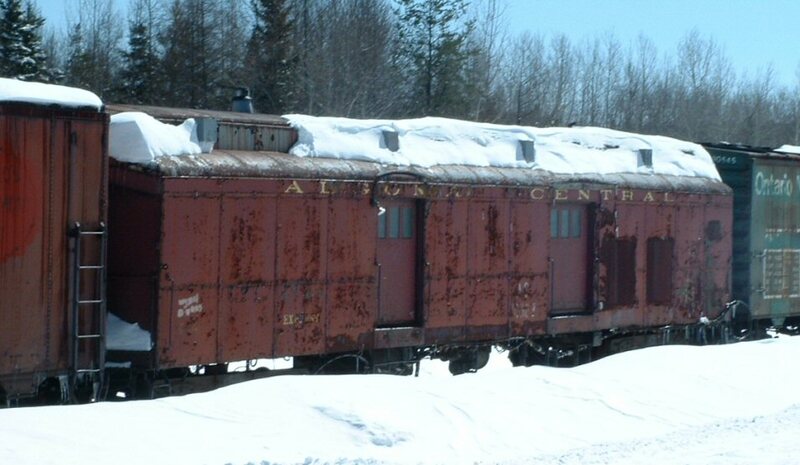 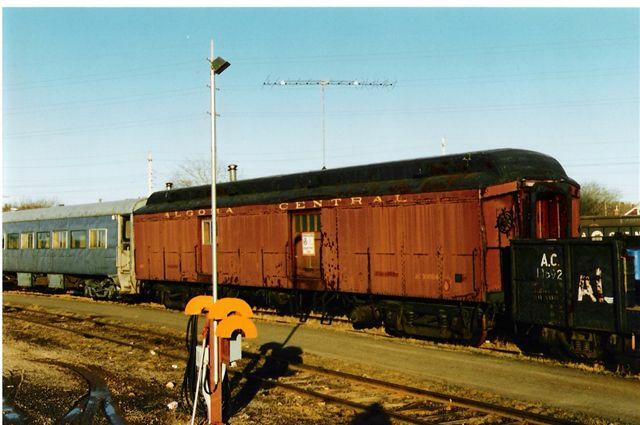 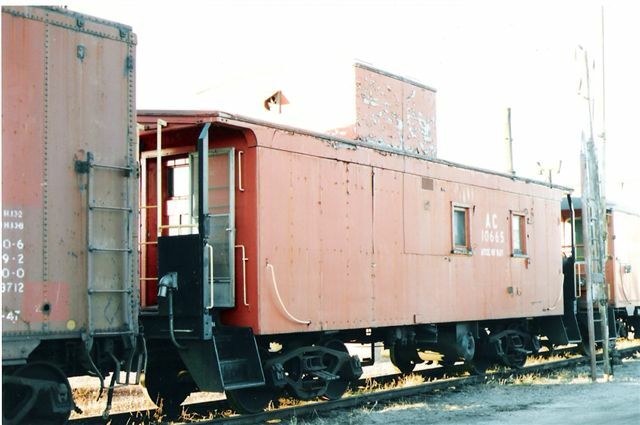 10618 Bunk Car Converted from an old 36' wood boxcar? 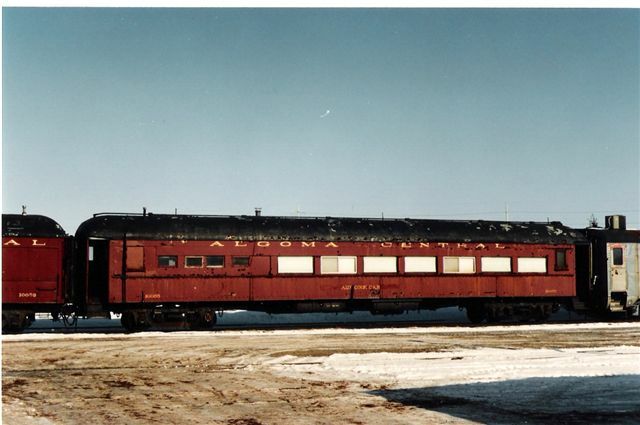 10621 Bunk Car Engineman's car. 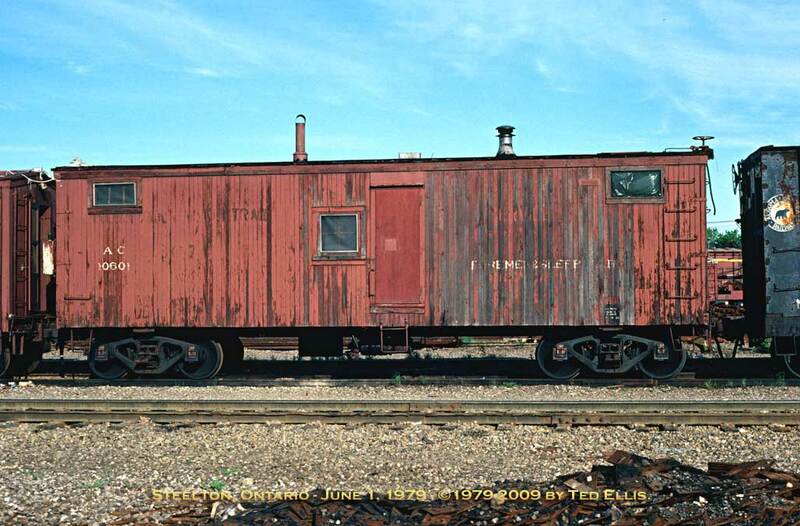 Converted from an old 36' wood boxcar? 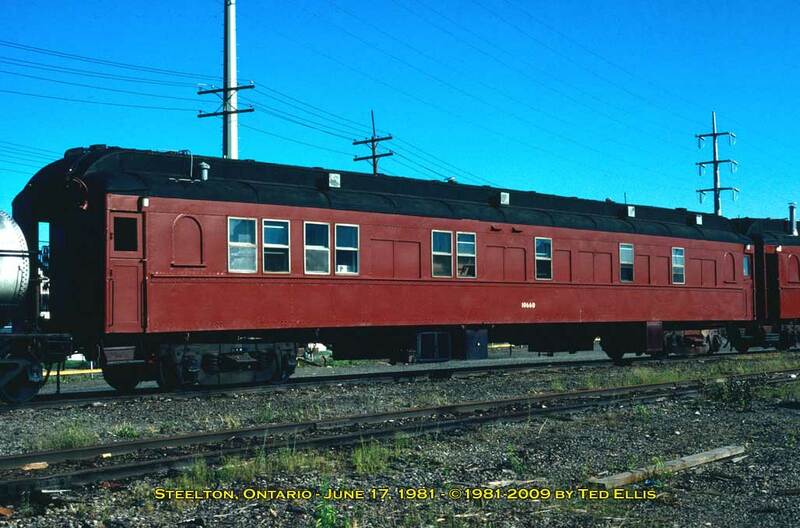 10632:1 Cook/Dining Car ex-Combination Baggage/Coach 226? 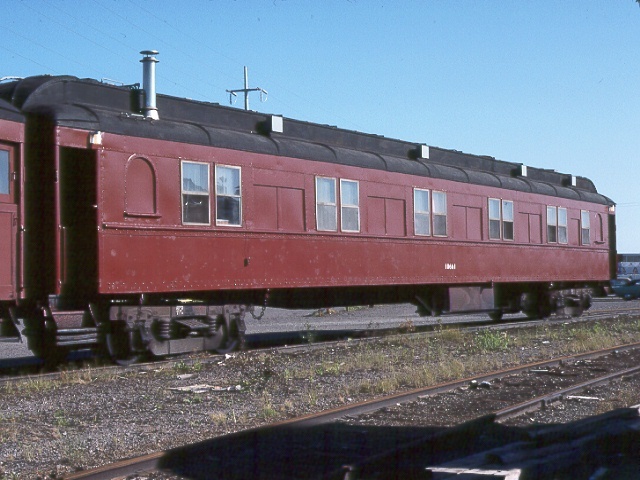 1950? 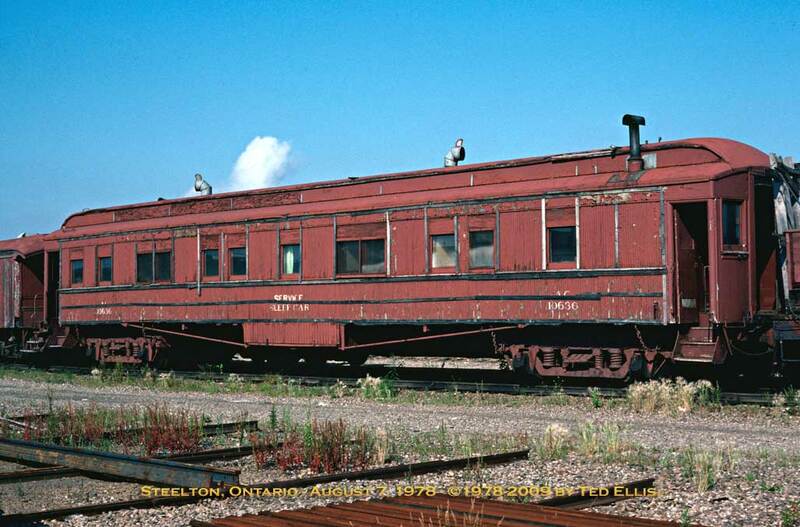 10636 Bunk Car Former 450-series wooden coach built in 1914. 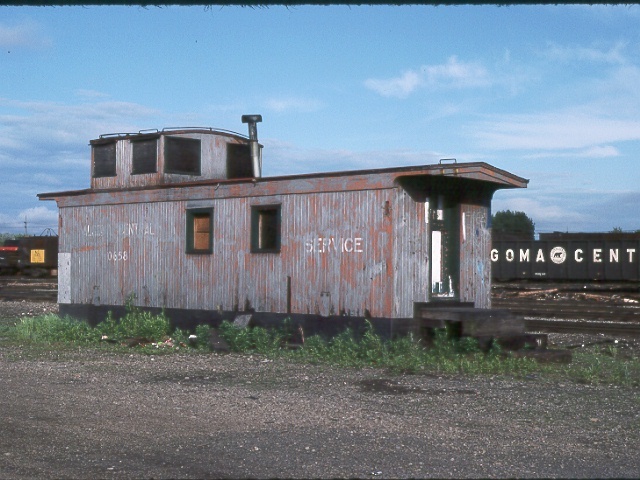 Scrapped 1979. 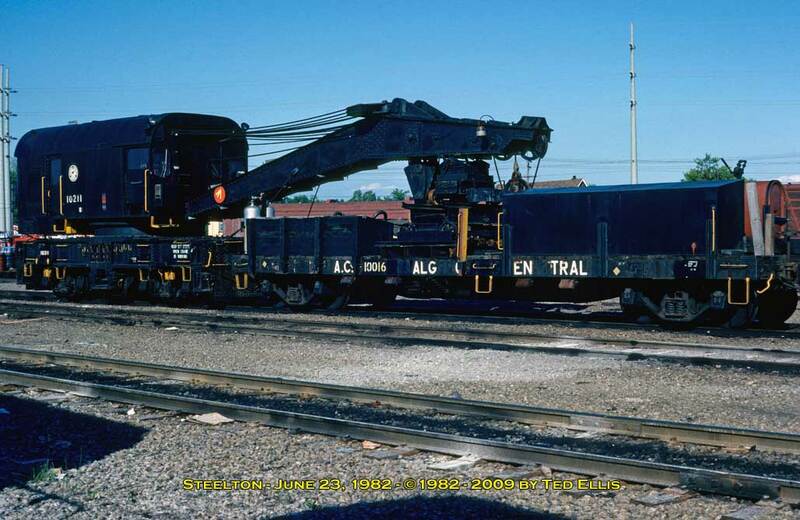 10663 Tool Generator ex-baggage AC 206 Photo 200x? 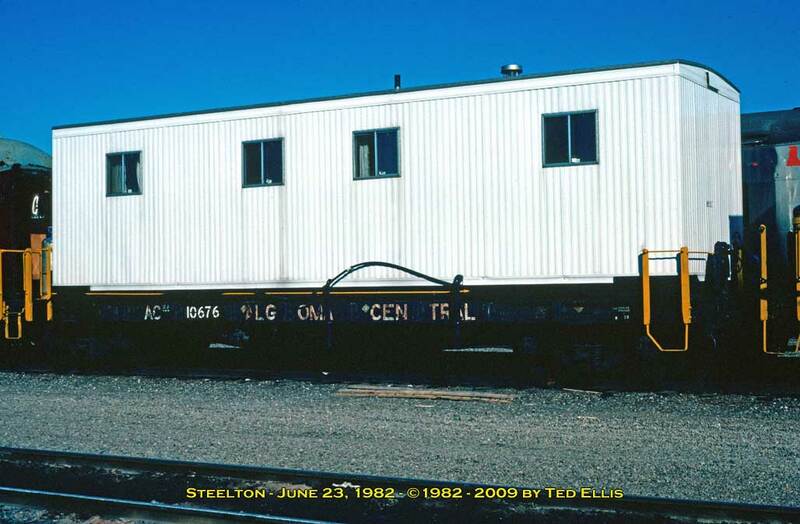 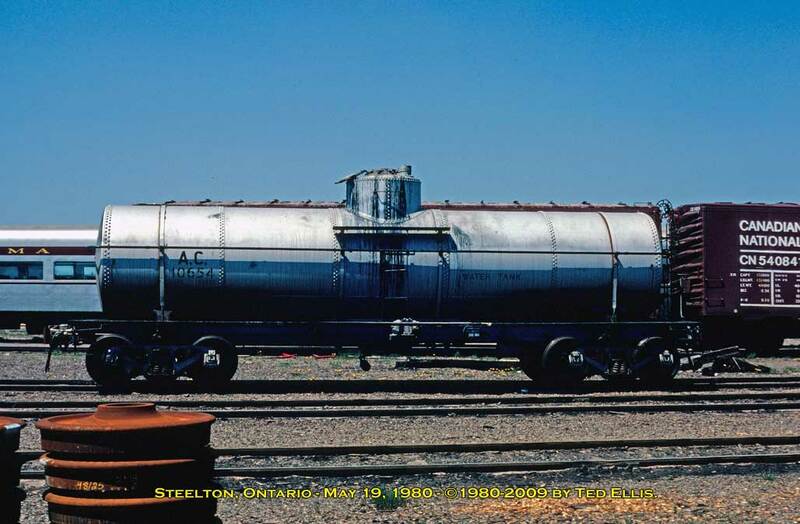 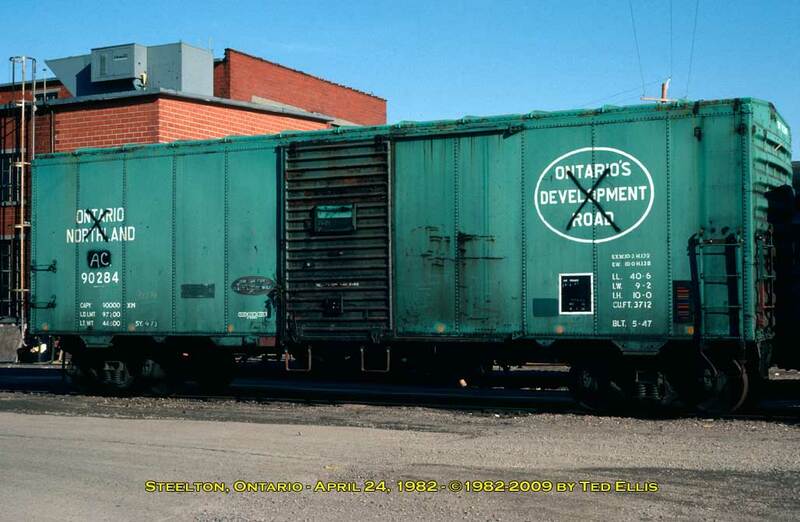 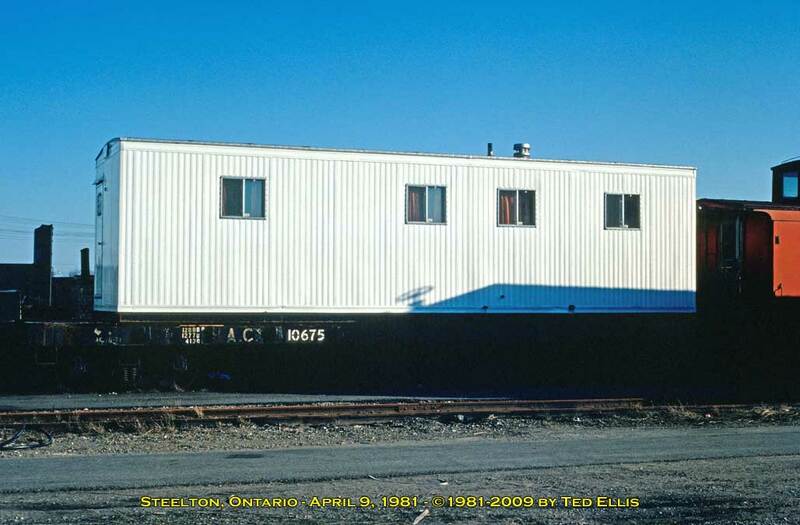 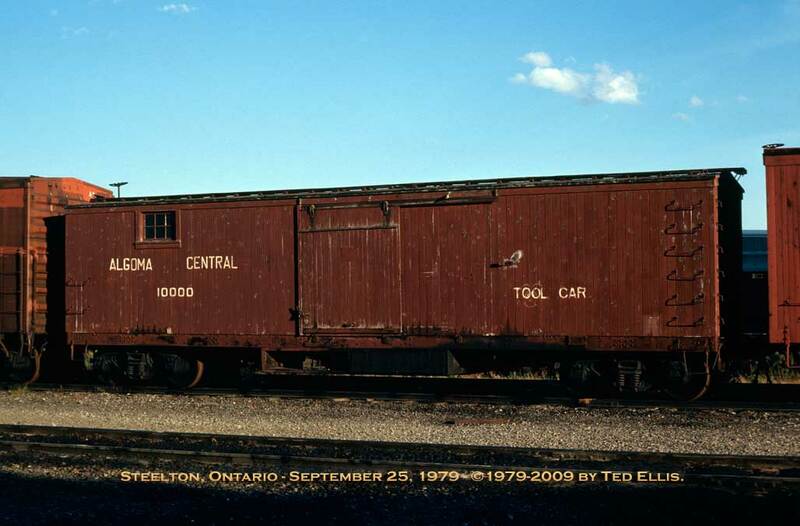 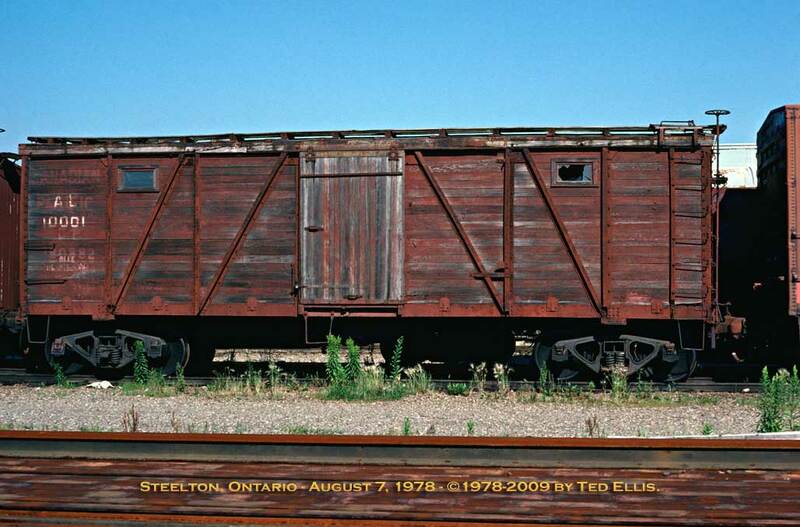 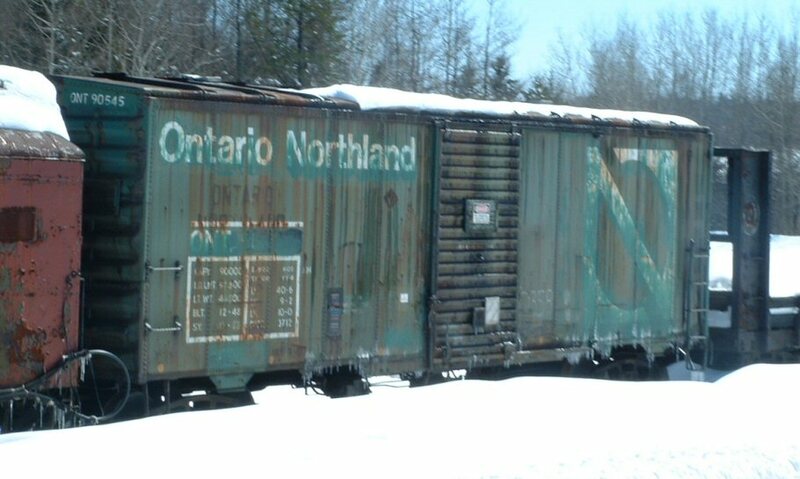 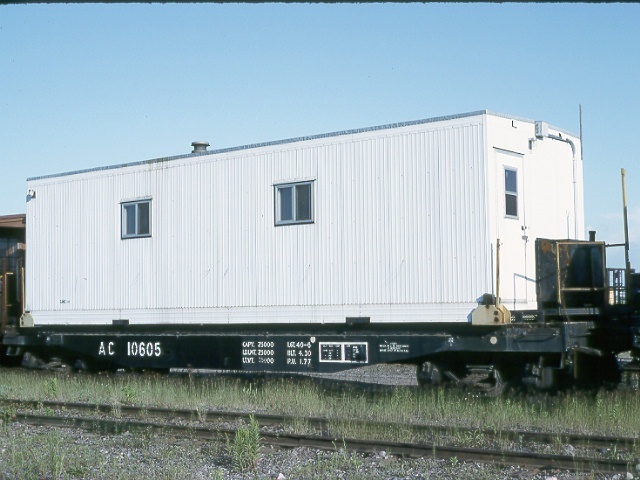 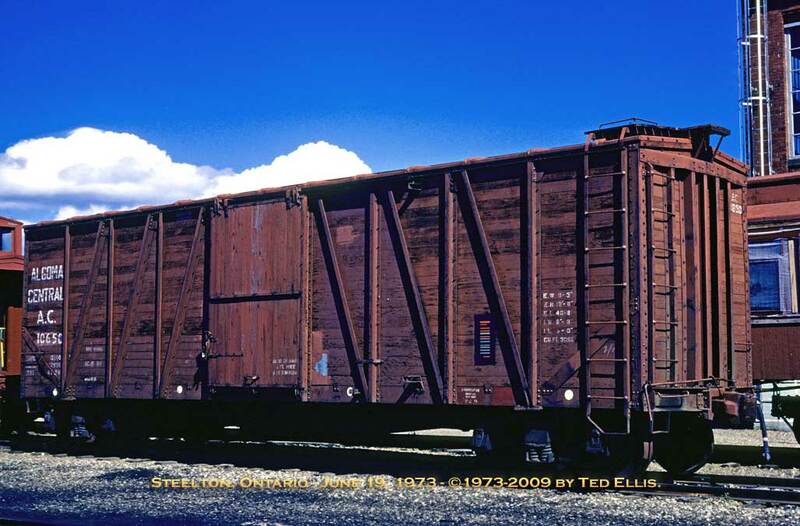 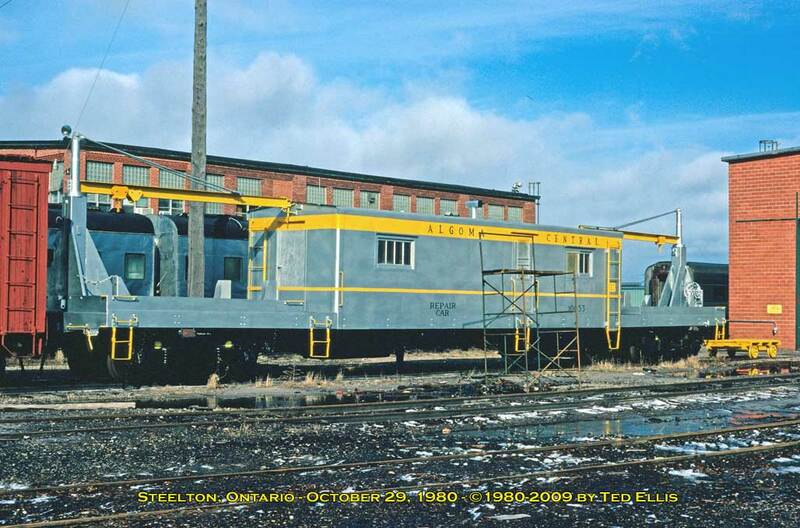 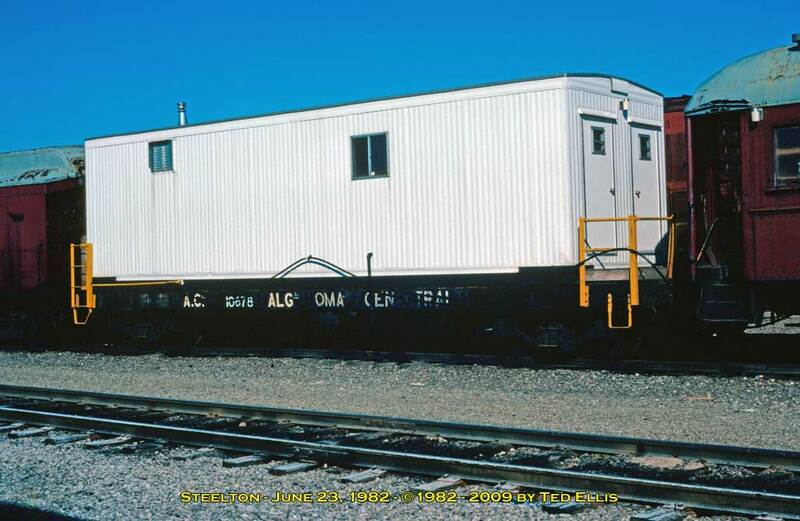 10690 Steel Box Car ex-ONT 2001? 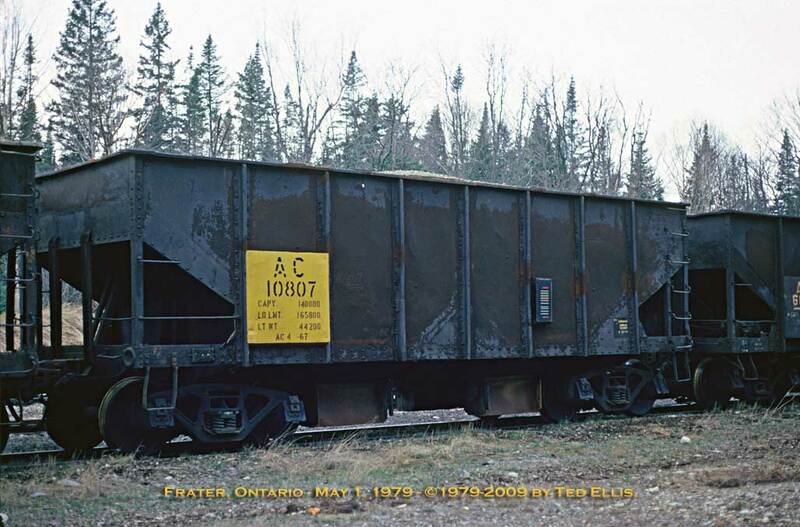 10724 Flat Car 40' flatcar. 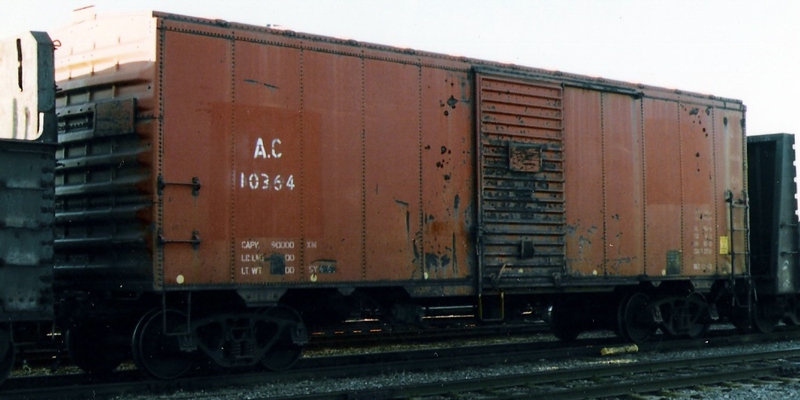 ex-AC 2200 series? 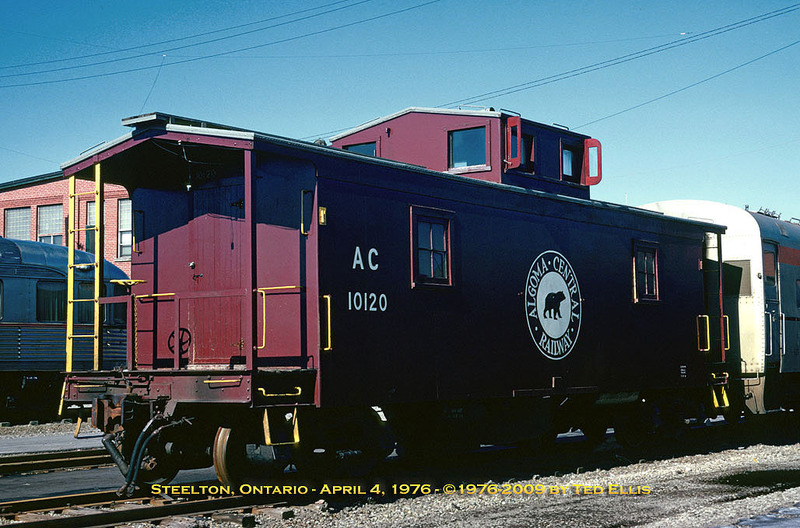 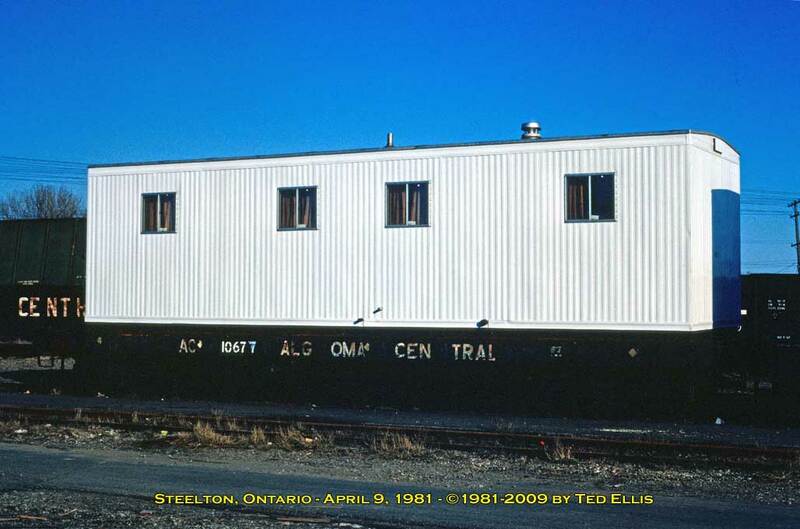 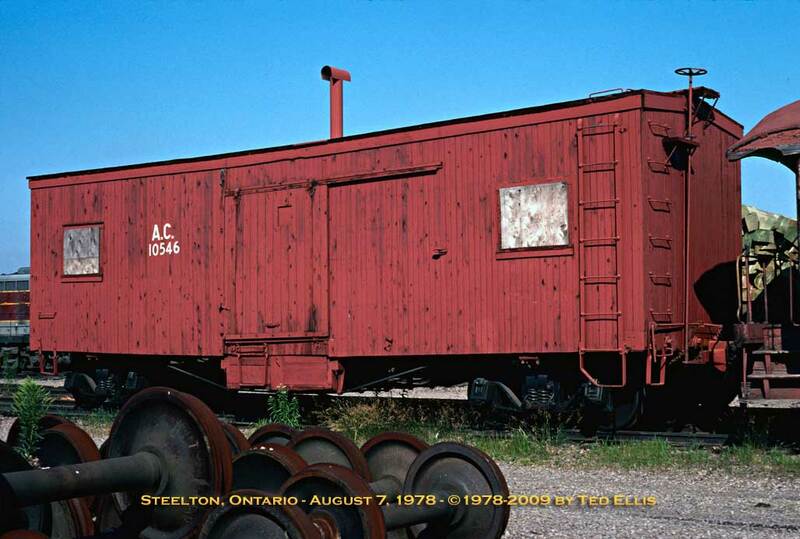 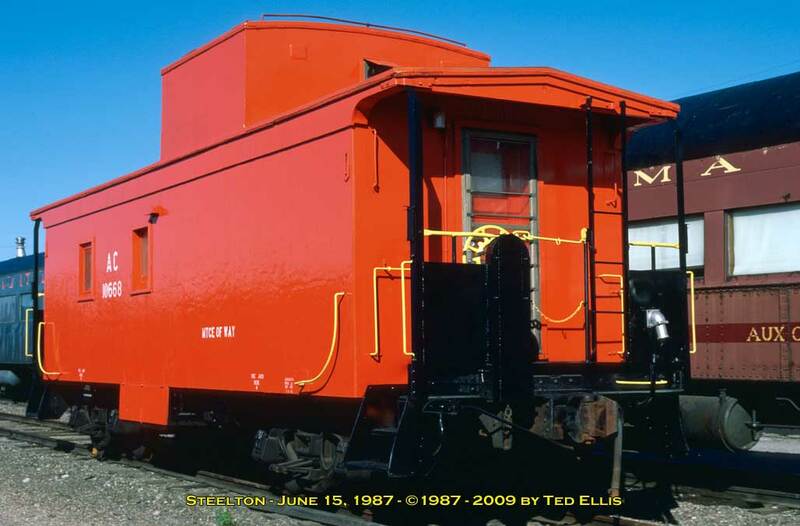 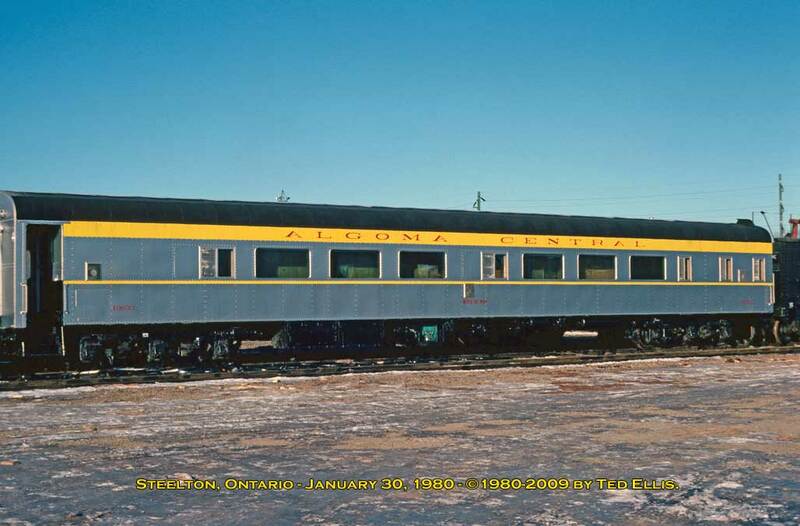 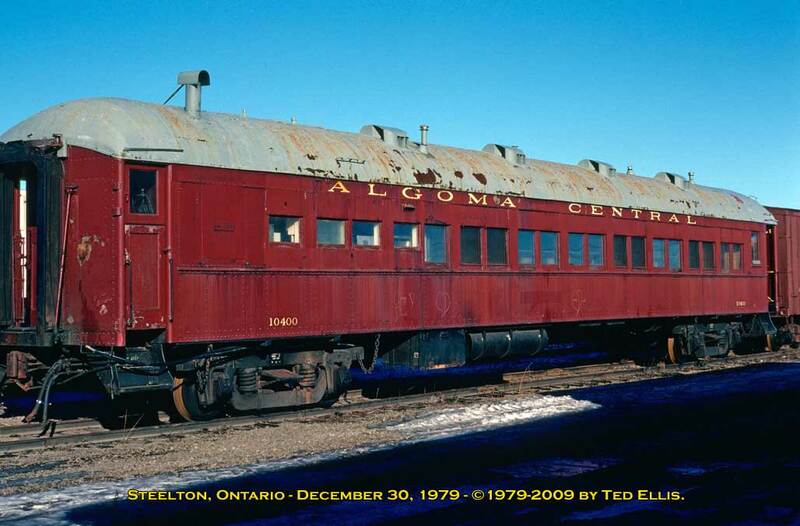 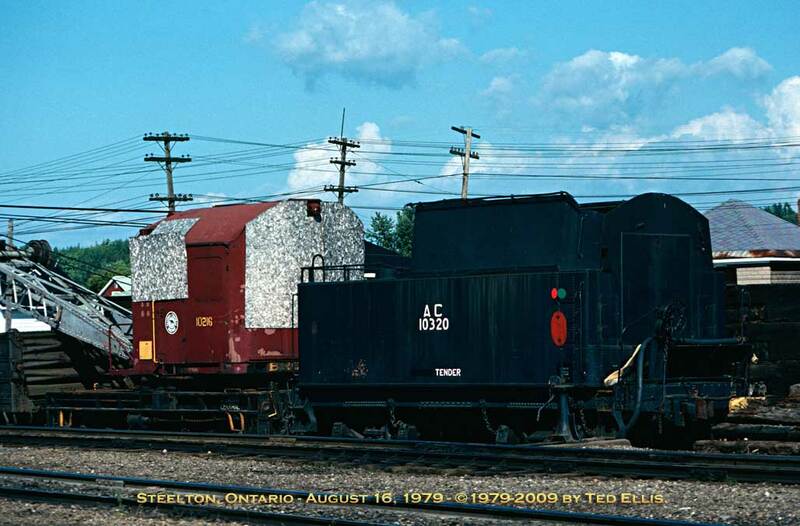 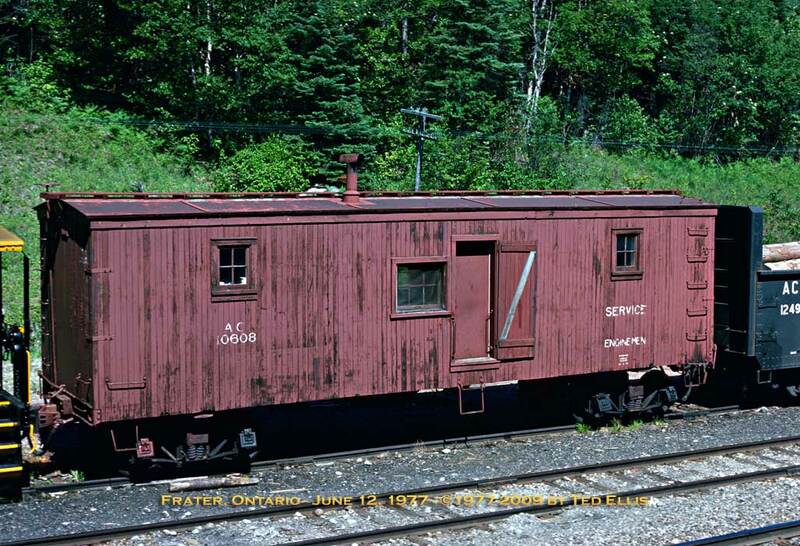 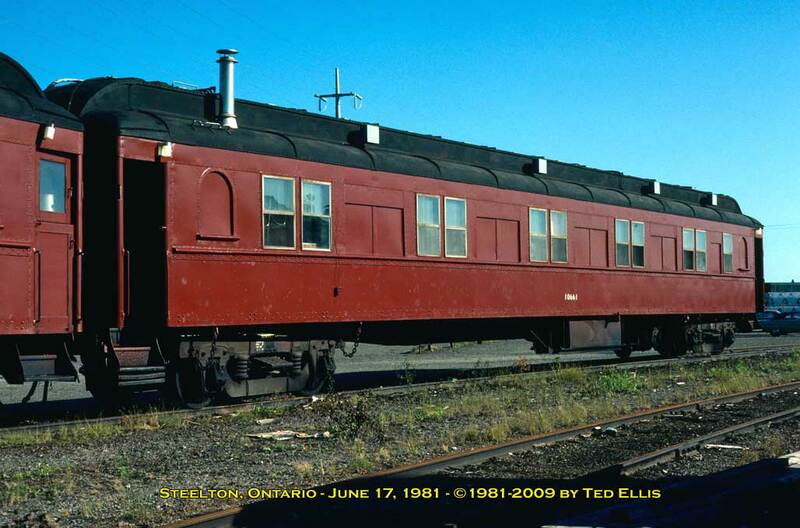 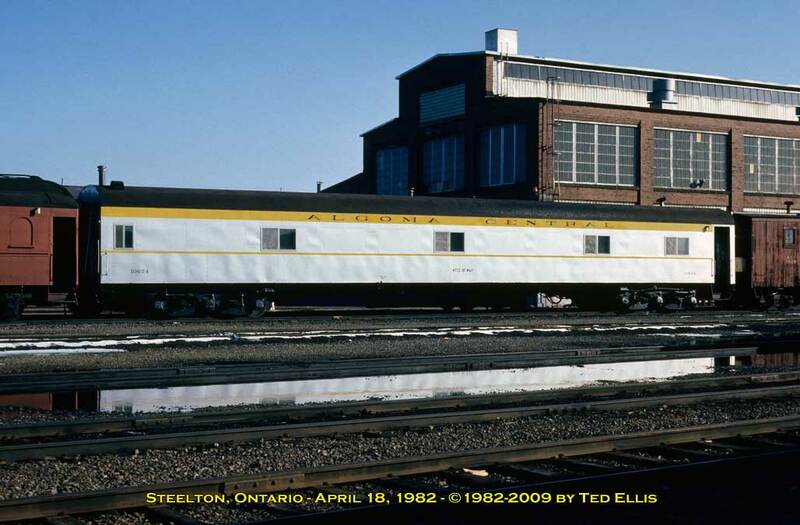 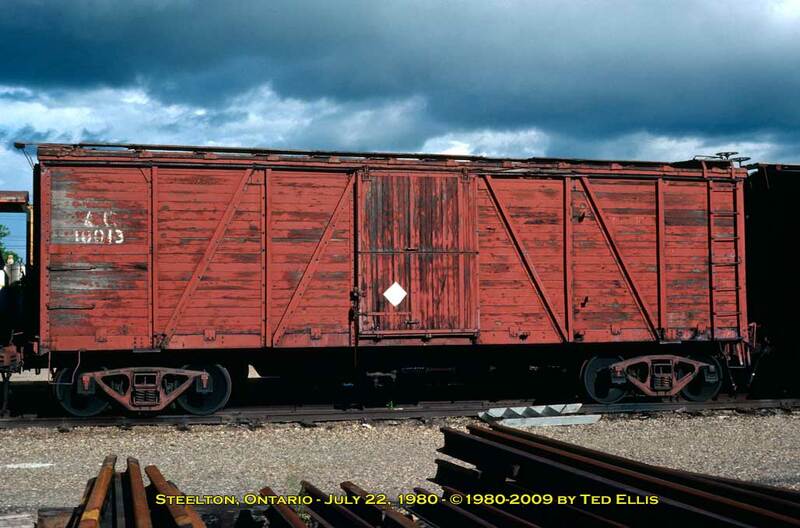 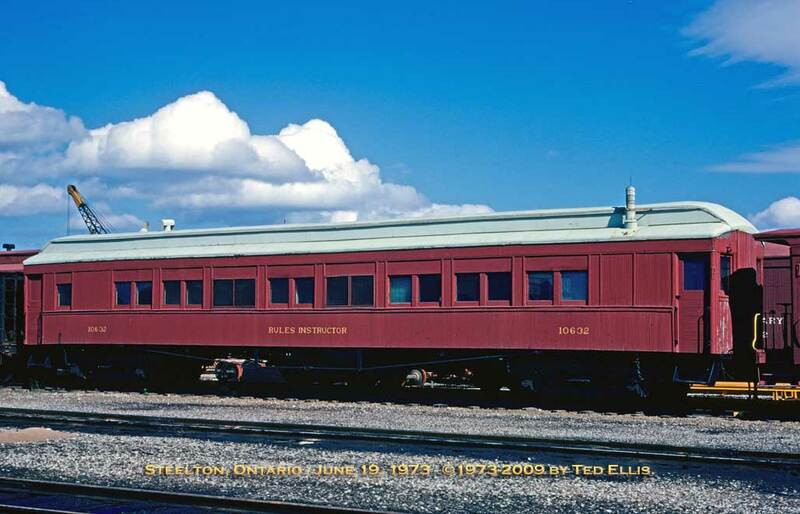 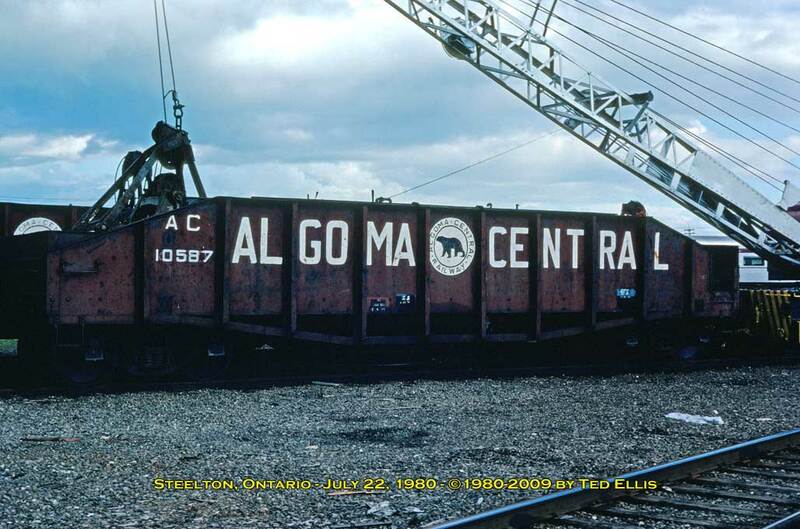 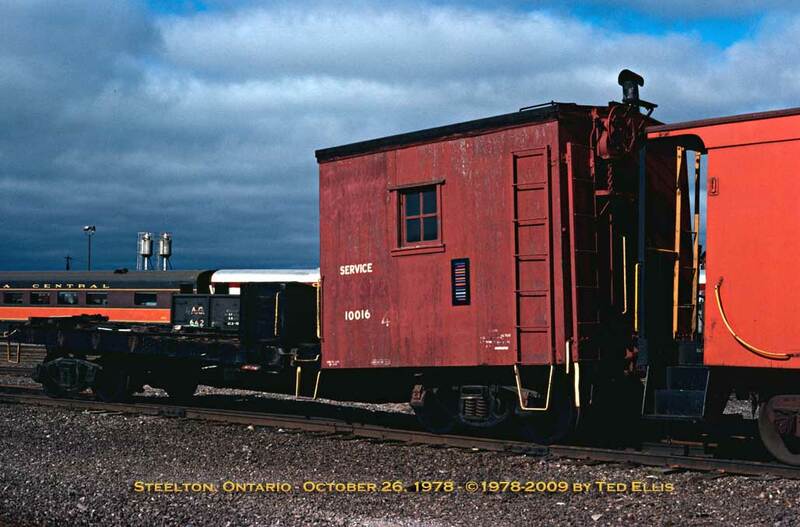 Information on this page is derived from photographs in the book "The Algoma Central Railway Story" by Dale Wilson and from Railway Photography by Ted Ellis.